When the term “energy efficiency” is raised among consumers, discussions typically surround appliances and other household items. However, energy efficiency isn’t limited to devices; it also extends to a structure’s physical construction. Whether a residential or commercial building, the walls and roof contribute to the comfort level within the structure. A building’s walls serve as protection from outdoor elements such as the wind. As the wind strikes the sides of a building, it’s diverted in several directions. If the building is not energy-efficient and lacks features like sealed window frames and proper insulation, the wind can seep into it. This leakage causes air pressure differences between the building’s interior and exterior. As a result, air is drawn either in or out of the building with pressurized strength. These air pressure differences can lead to warmer temperatures in the summer and cooler temperatures in the winter. Such temperature differences ultimately cause cooling and heating systems to work harder and, therefore, use more energy. 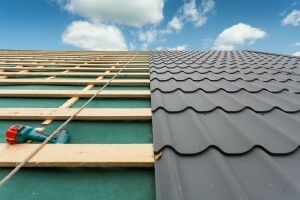 The construction of a building’s roof can also affect utility costs. When heat rises into an attic, this warm air can become trapped during the summer months. Without energy-efficient roofing, this trapped heat causes the building to remain warm and prompts an increase in cooling system usage. A roof should have a ridge vent to regulate temperatures. This way, hot air can escape without compromising the watertight features of the roofing system. Areas of the country that are prone to freezing temperatures during the winter should be equipped with the proper insulation for the surrounding climate. Insulation that’s meant for a sub-tropical region will only reduce the structure’s energy efficiency. Air will penetrate the wood, drywall, and insulation and force you to turn up the furnace to compensate for the temperature swings. When choosing insulation, it’s important to consider the correct R value. The higher the R value, the better the heat retention. When renovating or building a new structure, keep the roofing, walls, and insulation in mind. Ensuring that these features are constructed for energy efficiency will ultimately help to reduce energy costs. For more information on energy efficiency or for a free quote on insulation, contact USI online. USI believes that excellence in every step of the process and ensures timely completion and quality of service, time after time.